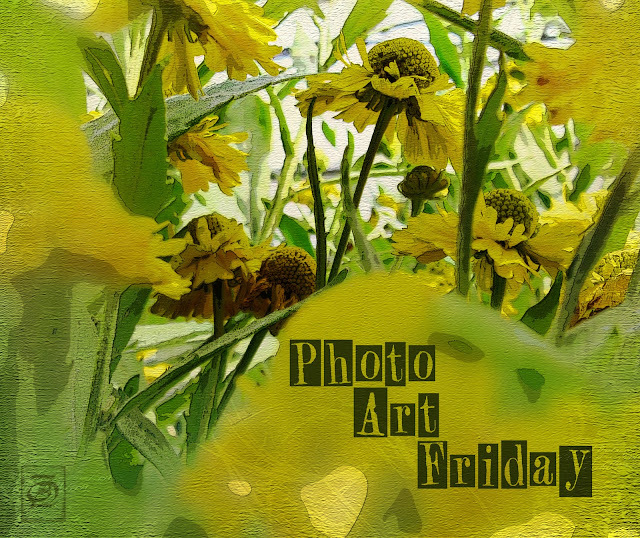 Welcome to the first ever Photo Art Friday! I can't wait to see the photo art you have prepared to showcase with us today. If you need a reminder about the guidelines for participation just click HERE. Don't forget that your submission must come from an image you have published on your blog, and that in that published post you need to include a link back to Photo Art Friday. So, without further delay, let's get this photo art vernissage/showcase started. Nice photo, I like the texture you present. Well, I had the honor of being the first. I like your sunflowers! I also have YOU to thank for the textures in my Crab Boat. I made my own for the steam engine! I am going to have to buy some more old books and photos! Time to make a trip to the antique store, I guess! i love the perspective of this photo and the way you edited very much. gives me a feeling of spring really rather than autumn, love that! Wonderful flowerfield with beautiful texture. And inlinkz works ! This sounds like it is going to be a very popular get-together. A vernissage indeed. Thank you for setting this up for us. I love the feeling of being able to walk amongst these gorgeously textured flowers with them towering over my head. Congratulations on the vernissage. A varied and inspiring collection of artistry. I will be back again to watch the unfolding exhibit. I love your "jungle" of yellow and green, Bonnie! Textures work so well! Thank you for providing this challenge. love your photo. this looks like fun, i'll try to stop back and link up sometime. Lovely entries - can't wait till I have time to join in the fun! I am SO inspired by the incredible photo art shared here so far. Love the diversity in subject matter and treatments. You've made my day! Seeing all your creative pieces just makes me want to get to work producing more art with my photographs. Thanks for hosting this. I've never joined a link party. It's fun. And, thank you for the great textures. I'm just now beginning to use textures. I'm having lots of fun with them. Well nothing like jumping in with total abandon as I am such a "newbie" at photography. - What a great place to start. Love your flower photo and the textural element. Very lovely and artistic treatment of the coneflower photo! Thanks for creating this place to 'show off'. Evelyn at Within My Focus just emailed me about your new meme & I'm so glad she did! This is great! Teresa: I could not find a way to comment on Red Bubble - perhaps you have to be a member? Hope you check back here so that you will know how much I appreciate your participation and how much I LOVE your poppy photo art - just beautiful. It's past midnight. I stayed up watching some retrospectives and remembrances of 9/11. Still chilling and sobering after all these years. Just want to express my appreciation for all the wonderful work you all have showcased here. I'm beyond gratified!!! Hope you will do the same next week!